I live outside of the Cedar Rapids and Iowa City Corridor area. 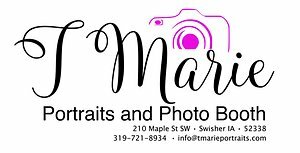 Can I still rent a photo booth from T Marie Photo Booth? If you live within 60 miles of the Corridor area, there is no additional travel charge. Outside of this, transportation fees may apply. Contact us for a free pricing consultation. Yes, we operate as T Marie Portraits and Photo Booth and carry a Liability Policy, which is suitable for most venues. My event is over a year away, do I need to reserve the photo booth now? You don't have to book today, however reservations inside a year fill up rapidly. We do not reserve dates without a $200 non-refundable deposit. 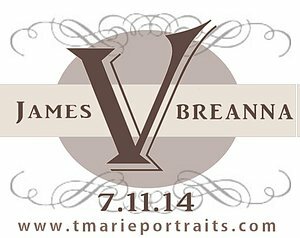 Yes, we can add a personalized logo, design, background, etc .. to the bottom of your photo strip. We will customize and design your photo strip based on your theme, event type and colors. 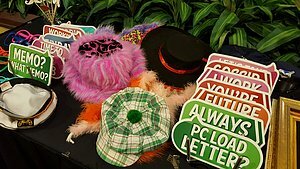 At what type of events are photo booths the most popular? 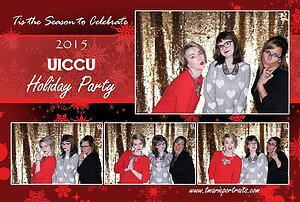 How does the enclosed photo booth work and how many people can fit? Our enclosed photo booth can fit 6 people comfortably and we can easily extend the booth to fit up to 12. The enclosed booth is very easy to use and there is an attendant on site at all times. Just get in, get your props ready and smile! There will be 3 photos taken with just a few seconds in between each photo. Inside the booth, you will be able to see yourself on the monitor. How much space is needed for the enclosed photo booth to be set up? We require at least a 8 ft x 8 ft section with a 10 ft ceiling clearance, however in order to control the lines we would really appreciate a little extra space for the 6 ft prop table and crowds. How does the open air style photo work and how many people can fit in the photo booth area? 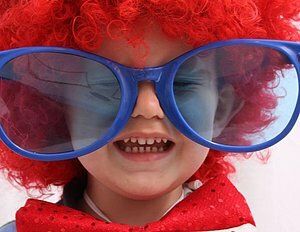 Our open air photo booth can fit a large crowd of people and would recommend keeping the number at 6. The open air booth is very easy to use and there is an attendant on site at all times. Grab your props, step in front of the background and smile! There will be 3 photos taken with just a few seconds in between each photo. How much space is needed for the open air style photo booth? No. Each photo booth package comes with unlimited prints during your event. 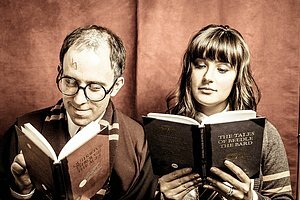 Do the photo booths print color or black and white photos? Booth photo booths print both color and black and white! Your guests get to make the decision. Are the photo strips printed at the event? Yes - your guests will get their photo strips within 15 seconds after their photos were taken! Do I get copies of the photos taken at our event? Absolutely! We will leave you a copies of all of the images after your event is over or you can download from our drop box account after the event. This is included in your photo booth package fees. What does the scrapbook option work in the wedding package? 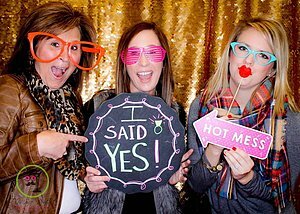 With the photo booth option, you will have such a wonderful album full of memories of your event. When a guests gets their photos taken, we print an extra print for your scrapbook. We have one attendant responsible for ensuring that all photo strips are included in your album and that each guest gets the opportunity to leave you a message in the book. All materials needed for the scrapbook album are included in the package fees. The album is giving to a responsible person before we leave your event.